LVLten is a quarterly publication geared toward teen and young adult performers of every genre (acting, modeling, dance and music). 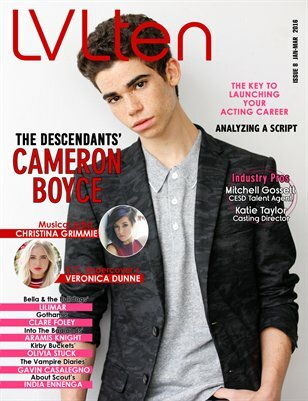 Our Jan-Mar 2016 issue contains exclusive celebrity features (fashion editorials with exclusive interviews) with Disney’s Cameron Boyce (Descendants), Recording Artist Christina Grimmie, Veronica Dunne (K.C. Undercover), Nickelodeon’s Lilimar (Bella and the Bulldogs), Olivia Stuck (Kirby Buckets), Aramis Knight (AMC’s Into the Badlands), Clare Foley (Gotham), Gavin Casalegno, India Ennenga and more! Exclusive Industry Pro interview with Commercial Casting Director Katie Taylor and CESD Talent Agent Mitchell Gossett PLUS articles on The Key To Launching Your Acting Career, Analyzing A Script and more!